Hi all, Bloomingdale resident (and firsttime Nextdoor user!) here. 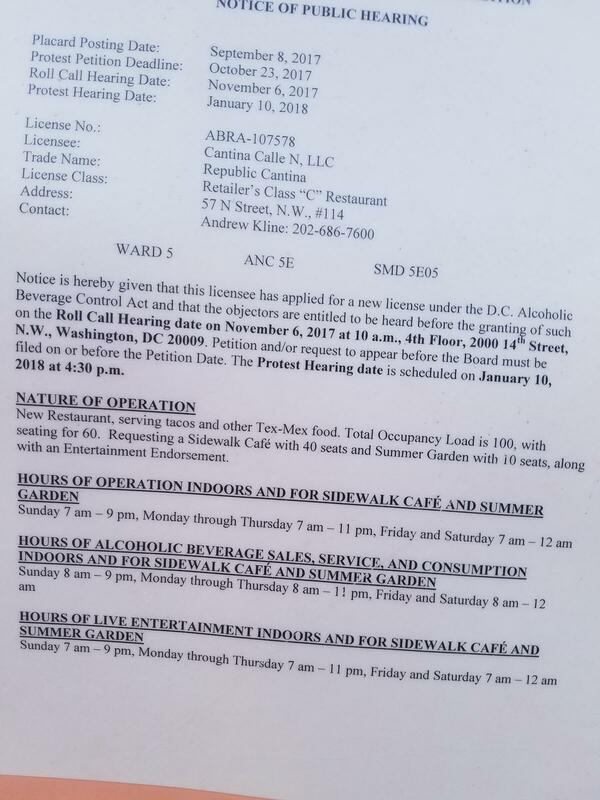 I’m involved in opening up a cafe/restaurant space in Truxton Circle (located at 57 N St NW). I believe there’s been some discussion here on Nextdoor on the project, then we also learned last week that ANC 5E voted to protest our liquor license application: https://www.popville.com/2017/09/anc-5e-protesting-liquor-license-for-republic-cantina-in-truxton-circle/ We were apparently a late add to the agenda and didn’t make it to the ANC meeting to be able to speak to the project, so are currently reaching out to the ANC and Hanover Civic Association to better understand neighbor concerns I wanted to do the same here; if you live in the neighborhood I’d love to hear from you about your thoughts/concerns. Feel free to reply here or reach out direct at republiccantina@gmail.com We’re also anticipating a protest vote by the Hanover Association as well as a separate group of nearby neighbors, so if you support the idea of a casual spot to grab a meal in Truxton, I’d love to hear from you. Since the Popville piece came out I’ve heard from a *TON* of supportive neighbors, and it will be great to see some ‘yes’ representation out at the upcoming meetings as well! Here’s a bit more about what we have planned: In short we’re looking to open a casual Tex-Mex cafe & restaurant — for the past few years we’ve been running a wholesale bakery that supplies pastries to many local coffee shops, grocery stores/markets, etc. We’ve been slowly growing the business with an eye toward someday opening a retail storefront. We’ll be open breakfast, lunch & dinner — kicking off with coffee & espresso drinks and of course our pastries in the AM, then a casual lunch & dinner service (tacos, sandwiches, Tex-Mex classics like fajitas/enchiladas). We’re also looking to add a simple beer/wine/cocktail list to accompany our dinner service. Our space is relatively compact at ~1300 sq ft; we’ll have a (very) small side patio on our property, then we’re also requesting a sidewalk cafe permit in front (also relatively small at 10×30′, and cordoned off with planter boxes). The building we’re coming into is a 100-yr old brick structure with a lot of history (e.g. the premises used to be a brewery responsible for Abraham Lincoln’s beer of choice), and our design for the space so far is really airy and beautiful. I’ve also been a resident of Bloomingdale just a few blocks north of our site for 5+ years– so am definitely familiar with the area and am looking forward to providing a good place to grab a meal and a beer in my neighborhood. I look forward to hearing from folks, and eventually becoming a gathering place for neighborhood once we open! Absolutely for this as well. How does the license application state otherwise? Sounds pretty low key to me. Do you prefer the hordes of drug addicts who frequent that block to a new neighborhood business? Chris, thanks for the post. Really excited! Can we stop with the whataboutism and straw men on these threads? It’s possible to work diligently for years trying to clean up the crime and drug use in this neighborhood while still having concerns about the particular ways a restaurant will affect a small street that hasn’t . Saying otherwise is a bad faith argument that needlessly villainizes and alienates your neighbors. The fact is that several neighbors, especially those closest to the proposed location, have legitimate concerns and questions they need addressed before they feel comfortable moving forward. The restaurant is still a year away from opening, so now would be the time to talk about those. I’m 1000% for a retail establishment going in here. I love tacos, beer and whiskey as much as anyone in this neighborhood and I’d love to see Republic Cantina in this space under terms they and their neighbors find mutually agreeable. I also know first hand about the trash, rodent and cut through-traffic issues we face in this and adjacent blocks and I’d like to hear how the business plans to prevent exacerbating them. I also understand wanting assurances that they won’t suddenly find themselves directly across the street from a bar when every indication from the developer to this point had been that a cafe or grocery was to go into that space. The protests being considered are necessary only because the business caught neighbors by surprise rather than engaging the civic association and ANC before applying for its liquor license. The goal isn’t to stop the application from moving forward but rather to make sure the restaurant is operating on mutually beneficial terms as a *part* of this neighborhood. I think there’s room for an agreement, and I’m optimistic that Chris S will come to terms with his business’s new neighbors and be a fixture of the area for years to come. But to go back to my first point, please remember that having legitimate unanswered concerns with a much larger-than-anticipated business opening at your front door is not the same thing as preferring bullets and syringes to tacos and beer. @Adam I think that’s a fair response. We’re looking forward to hearing more about specific concerns and are certainly open to finding a middle ground. I have no intent of disrupting the lives of my direct neighbors (i.e. if nothing else– my best potential customers ;). Already the closing hours we requested are *well* before DC last call — a reflection of our neighborhood location. We’re coming out of the gate with a deliberate nod toward potential neighbor concerns and (attempted) realism about what’s appropriate for our site. We were dinged for a lack of engagement with the neighborhood groups (a genuine mea culpa– this is admittedly my first time opening a brick/mortar storefront and I may have gotten some steps out of order), but since then my attempt at neighborhood engagement has consisted of being shouted down 30 seconds into my presentation at the recent Hanover Association meeting, then reaching out repeatedly to our ANC and HACA leadership and being met with silence. I *have* however had better luck setting up one-on-one meetings with concerned citizens directly. To that point: if you live in the neighborhood and have concerns– please reach out, I’d be happy to meet and discuss. Brass Knob was an operating business when I moved to the neighborhood, and I’m one of the newbies. That’s not neglected for 30 years. The same neighbors you’re dismissing have been meeting with the developer of the condos for years. They’re into it. They’re not being unreasonable. “Largely neglected.” You seem set in your position. Keep up the righteous fight. I strongly support Republic Cantina on this one – minimal noise and an uptick in traffic is a virtually non-existent price to pay for a quality organization like this taking a risk and helping to revitalize our area. Happy to do whatever I can to help make this happen.